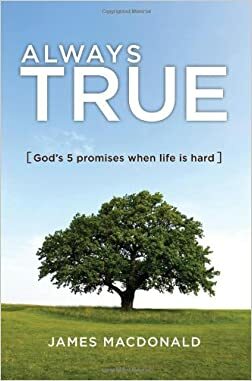 Always True: God’s 5 Promises for when life is Hard is a follow-up book to author James MacDonald’s previous book When Life is Hard. The book outlines five promises from the Bible that people going through difficult times can find comfort in. MacDonald writes how these promises took him through difficult times. Each chapter is preceded by a short devotional tagged “Theology of a Promise,” each dealing with an aspect of God’s nature. According to the author, God does not owe us anything, because he’s God, but miraculously, he has made some “exceedingly great and precious promises” to people. He notes that each person’s relationship with God is shaped by their response to God’s promises, and that these promises are the antidote to despair and the best option for anyone who is struggling. There is sometimes a gap between believing God’s promises and actually receiving their outcome, which the author defines as “walking by faith.” The author recommends memorizing promises from the Bible. Theology of a Promise: God is a Promiser by nature. The author asserts that it is in keeping with God’s nature to make and fulfill promises. In this chapter, the author discusses fear’s debilitating effects, and how the Bible repeatedly addresses the problem of fear. The author posits that fear must be replaced by faith. Fear is unnecessary, he argues, because God is always with people, defending and helping them. Theology of a Promise: God keeps His promises. The author points out that although people are fallible and don’t always keep their promises, God never fails to keep a promise. God’s promises are covenants and he does not break them. According to the author, Christians should not doubt, but instead believe and live by God’s promises. In this chapter, the author discusses both conditional and unconditional promises of God, and the sovereignty of God. Theology of a Promise: God wants us to test His promises. The author states that God is not offended by questions but wants people to test his promises, and when they do, God proves himself true and does not fail. In this chapter, the author discusses the ultimate goodness of God, and how faith in that goodness can keep believers from despair. Theology of a Promise: God’s promises are activated by faith. The author asserts that God’s promises become more meaningful in times of difficulty when reassurance is needed, and that God’s promises are activated by faith. In this chapter, the author discusses “faltering,” or losing faith, giving in to temptation or simply giving up on life. He asserts that if a believer has faith, God will take them not away their problems, but help them to get through them. Theology of a Promise: God’s promises are experienced in Jesus Christ. The author explains that all of God’s promises are manifested and fulfilled through Jesus. In this chapter, the author provides a long-term perspective on life’s problems, that eventually, God will have victory and all will be well. He asserts that God’s followers will be rewarded. In this afterword, the author says that people who believe God’s promises will experience greater blessings in their life. This page was last modified on 22 February 2016, at 13:38.